ELIMINATE MOLD – The mold grows in your towels after showing. The towel warmer help you eliminate mold and mildew. It warms your underwears, handkerchief, swimsuits, baby blankets and bedding without the use of your dryer. WALL MOUNTED & EASY TO USE – The wall mounted design can help you save space in a limited room such as bathroom. Simply turn on the switch and warmer will reach optimum temperature. BUILT-IN THERMOSTAT & SAFE – The warmer has built-in thermostat which can keep the temperature and save energy. It is more durable and sturdy so it isn’t dangerous when kids are around. FAST HEAT – The power of warmer is 150 watts that is powerful enough to warm your towels in a fast speed. It is definitely your best helper in the daily life. 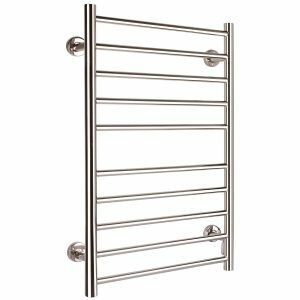 EAY TO CLEAN – The towel warmer is constructed of 201 stainless steel. It not only upgrades the stable but also offer the easy cleaning way. You only need to clean with a dry cloth when it does not work.